Hero MotoCorp is one of the most reputed and largest two-wheeler manufacturing company in the country. The company holds a large chunk of sales in the commuter motorcycle segment with the legendary Hero Splendor/Passion series. And now it is putting quite an effort to expand its portfolio in other segments of the market as well. The gearless scooter segment has been in vogue since the past few years and Honda’s Acitva is the undisputed king of this segment till date. 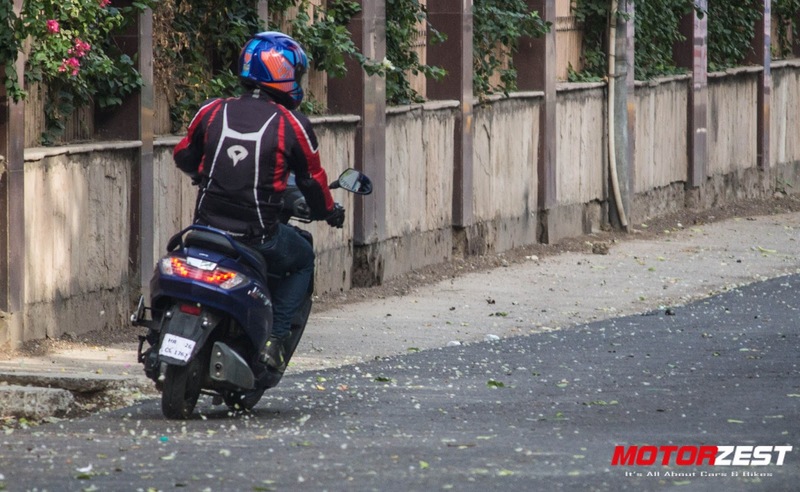 Hero MotoCorp have recently come up with their new scooter, the Maestro Edge to challenge Honda's dominance in this segment. We got a chance to test ride this scooter and sense what all the company has to offer in this exciting package. On first glance the Maestro Edge is an awe-inspiring scooter with a lot of flair to it. The scooter we got for testing was a matte blue version and this paint scheme makes the overall appearance of the scooter even more charismatic. The front gets a beefed up chunkier feel to it with bits of black coloured plastic adding to the overall look. The sides of the scooter boast distinctive lines along with a 3D Maestro Edge badge. As far as the rear goes, it is the most striking feature of the scooter with a beautifully crafted LED tail lamp setup. The company has equipped this scooter with numerous features. The instrument cluster looks stylish and is quite precise and also has a multi-functional digital unit embedded in it which displays the trip meter, service reminder & a side-stand indicator as well. 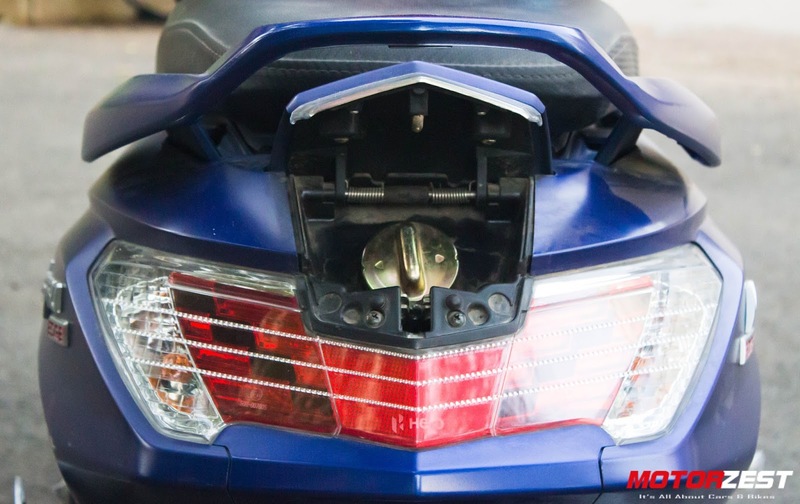 The Maestro Edge apart from the conventional headlamp setup also gets a pass-light feature that proves to be quite handy. Apart from all this, what is noticeable is a boot light and a USB charging port under the seat. Few other unique features of the Maestro Edge include blackened out alloy wheels, matte grey exhaust tip and a very convenient key setup which can open both the boot as well as the petrol lid behind the seat, dual tone rear-view mirrors and much more. All these features give a very neat characteristic feel to the Maestro Edge. The only downside to the body of the Maestro Edge is that it is purely made out of fibre, and despite having a full fibre body it weighs a bit on the heavier side on being compared to its competitors. 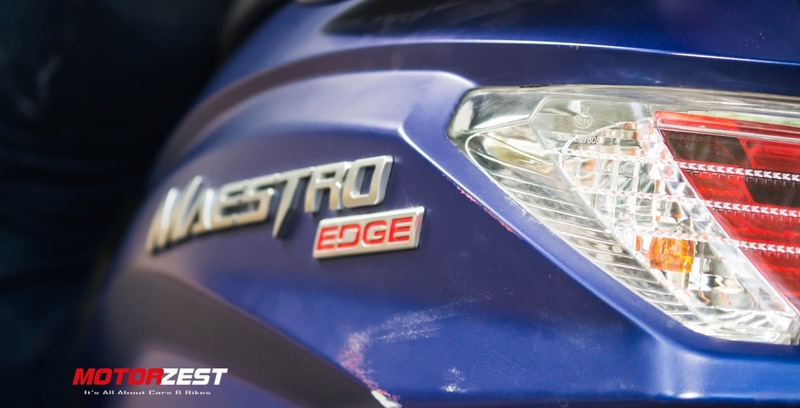 While on being compared to its predecessor, the Hero Maestro this new edition Maestro Edge is a big improvement on the design front with a compact body structure and also more elegant side profiles. 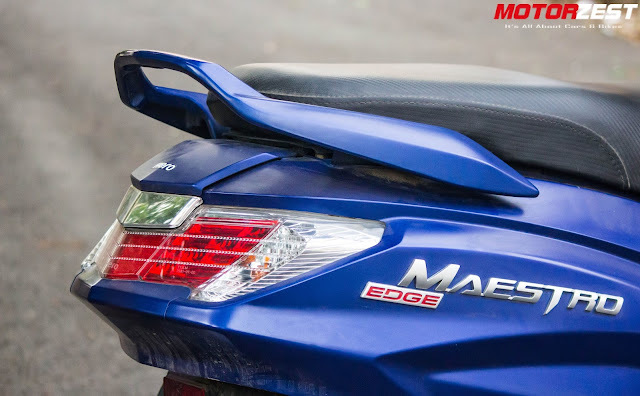 Under the body of the Maestro Edge is an all-new 110cc air-cooled, four-stroke motor that is mated to an automatic gearbox churning out 8.31 bhp of power and a max torque figure of 8.30 Nm @ 6,500 rpm. This new engine has slightly more power but a little less torque than the engine of the Hero Maestro which churns out 8.05 bhp of max power and 9.10 Nm of torque. Although the power seems enough but on testing the Maestro Edge it was pretty slow off the line. 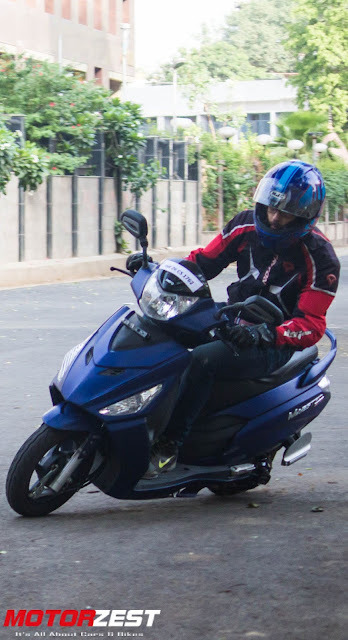 The pick-up of the scooter is not upto the mark and it takes quite some time to reach 45km/h, but after reaching the 60 km/h mark, the scooter responds pretty quickly. We were able to achieve a top speed of 90 km/h (speedometer reading) with the Maestro Edge. Another noticeable feature of this scooter is the exhaust note which gets a bit grumpy when given full throttle. 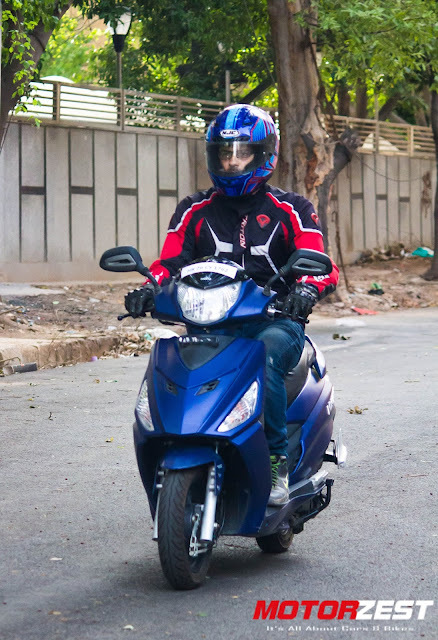 Overall, the engine performance cannot be compared to the Honda Activa but is quite satisfactory and riding the Maestro Edge in city conditions is pretty comfortable. The Maestro Edge sits on 10-inch wheels at the rear and 12-inch at the front end, this is another improvement than its predecessor the Maestro that has 10-inch wheels both on the front as well as the rear end. 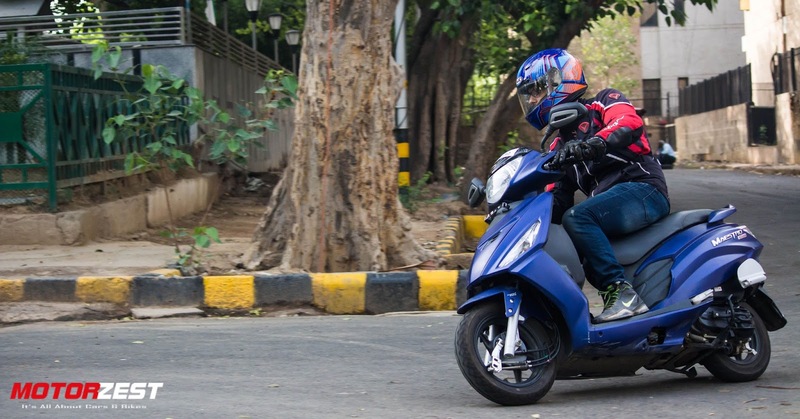 The suspension setup on the rear end is of hydraulic type while on the front the scooter boasts a telescopic setup. The braking is handled by drum brakes on the front as well as the rear. Combining all this, the ride quality of the scooter is on the softer side and its soaks up small bumps and potholes with ease. In addition to this, the suspension setup also helps in adding to the cornering abilities of the scooter. The Maestro Edge tackles corners with such ease without loosing any traction, this makes up for effortless maneuverability in city traffic conditions. 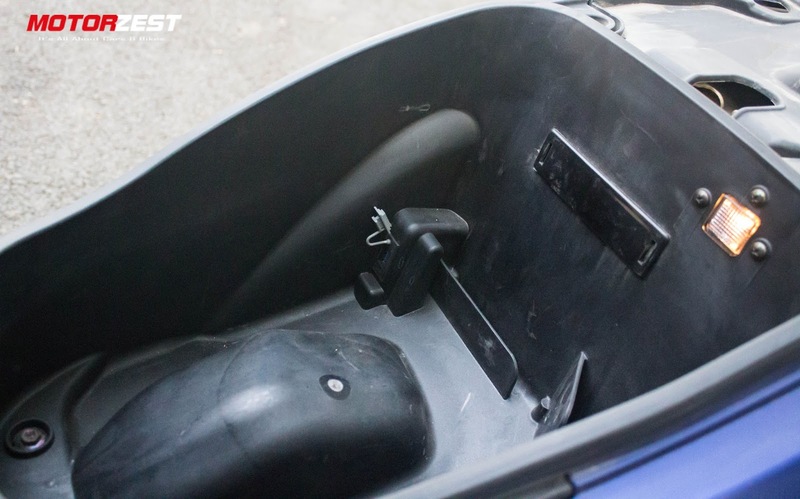 The large seat also helps to further enhance the overall riding experience of the rider as well as the pillion. The only downside in the handling department are the brakes, they are not quite responsive. On testing we found out that coming to a stand still from a high speeds takes a bit of time and this is one area of concern that the company needs to focus on. 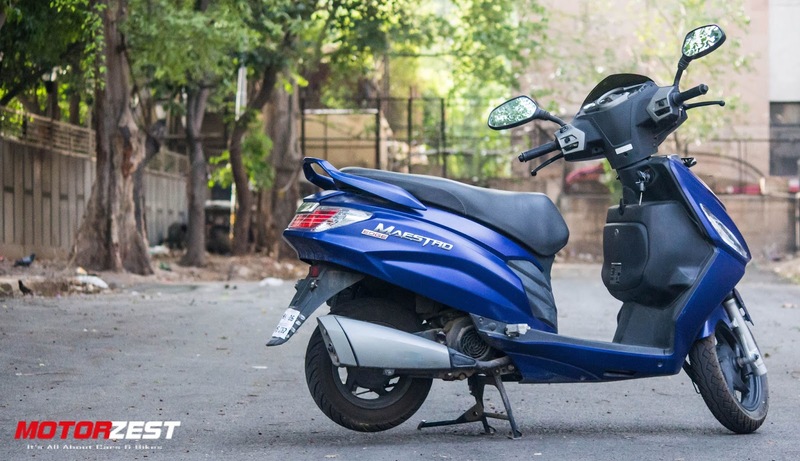 Although there are some downsides to this scooter but overall, the Maestro Edge is a complete all-round & quite an appealing package offered by the company. This flagship Hero scooter is priced at Rs. 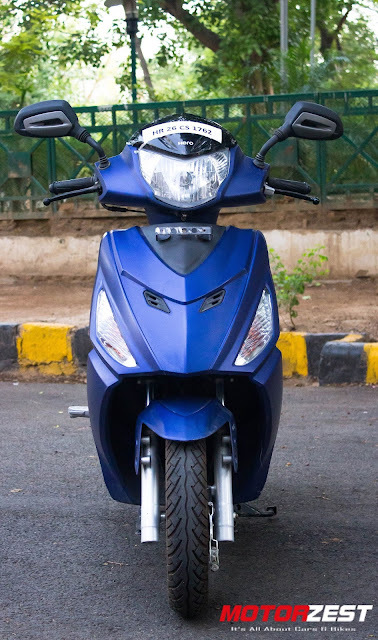 49,700 (ex-showroom Delhi) and at this price it would give a tough competition to its rivals which include the Mahindra Gusto, TVS Jupiter and the segment leader Honda Activa 3G. 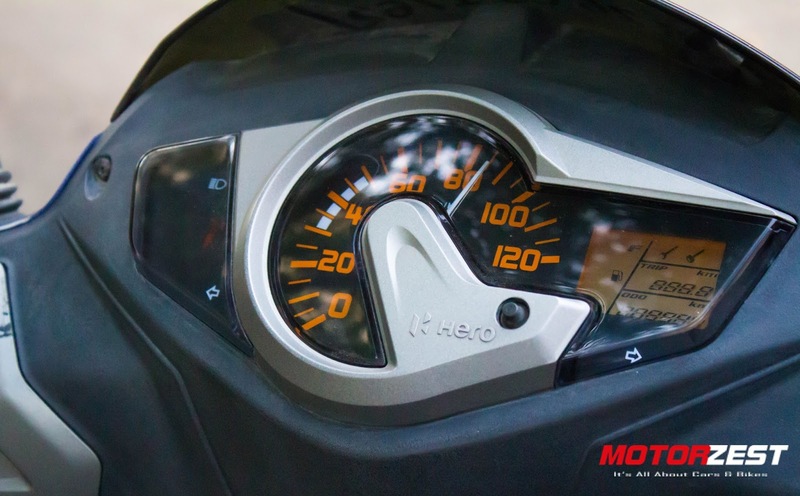 Hero is hoping to grab a large chunk of the share in this market with the Maestro Edge and maintain their overall dominance in the two wheeler industry.